We believe that companies of all sizes have a responsibility to their customers and their environment for reducing their carbon footprint through energy conservation. Motorcycle Shippers does our part by providing environmentally friendly motorcycle shipping services. With over 1100 trucks moving within the network, we carry the burden proudly. 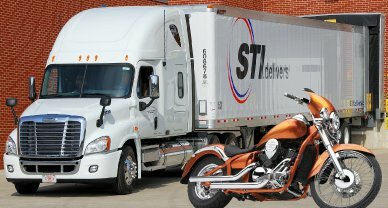 As the Premier Motorcycle Transport Company for Specialized Transportation Incorporated (STI), Motorcycle Shippers is proud of the partnership with The U.S. Environment Protection Agency’s SmartWay program. Their efforts are designed to improve energy efficiency and reduce greenhouse gas emissions and we are now contributing to the partnership’s goal to reduce 33 to 66 million tons of carbon dioxide and up to 200,000 tons of nitrogen oxide per year. Read the entire press release. We understand that good decisions for our environment are good decisions for our customers.